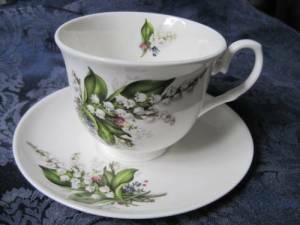 White bell shaped flowers nestled among vivid green stems makes an elegant pair of bone china cup and saucer sets by York. The cup and saucer are dishwasher and microwave oven safe. White bell shaped flowers nestled among vivid green stems makes an elegant pair of bone china cup and saucer sets by York. Lily of the valley is the flower for the month of May. Lily of the valley means a return of happiness, purity of heart, sweetness, tears of the Virgin Mary, you've made my life complete, humility, happiness, love's good fortune. The legend of the lily of the valley is that this flower sprang from Eve's tears when she was kicked out of the Garden of Eden. It is also believed that this flower protects gardens from evil spirits.